Review published in IJPE, Vol. 6, No. 2, March 2010, p. 122. This book is intended for those who write papers and are invited to make presentations at national or international gathering of researchers or scientists for dissemination of the idea contained in the paper among peers. The author of the book has been a trainer of researchers and scientists from A*STAR Research Institutes, Singapore and a former Director of Apple-ISS Research Centre, Singapore. He deserves to be complimented in producing a book that explains in great detail how scientist and researchers must prepare, design and present their scientific research and make presentation of their papers before an audience of learned people. Identifying the difference between writing a paper and making an oral presentation of the scientific work, the authors goes into nitty-gritty of selecting the essential content from a paper for making slides and presenting them to make a maximum impact on the audience to whom the presenter acts as a host. Oral presentations exploit the visual channel where in front of the audience stands a person who has authored a paper and whose authority is going to be assessed through his or her persona, confidence, look, voice, pace and tone, facial expressions, charisma, energy and ability to answer technical questions effectively during the question and answer session and to remove doubts of the questioners. All these factors finally make an impact over the audience and the author discusses them in minutest details in a very lucid and effective manner. The reviewer very strongly recommends that such a book must be read by all graduate and doctoral candidates who make presentations of their work before the peers, colleagues and their professors. In fact the reviewer feels such a book or a course must be made compulsory for all graduating and doctoral candidates so that they learn the art and science of making effective presentations. Making a new scientific contribution is definitely something creditable but presenting this work before an audience, convincingly, is even more important requirement of a scientist or a researcher. In this respect this book supplements and trains to improve the quality of a scientist or a researcher. The reviewer has no doubt that the book more than adequately serves the purpose for which it was written. It is the most comprehensive treatise on the subject. The imaginary audience of different members with varied interests and purposes attending the presentation and illustrating how their expectations can be met by the presenter, makes the reading of the book very lively and interesting. 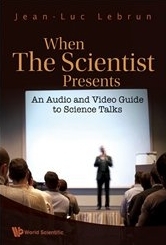 This book is a must for all scientists and researchers. The book comes with a DVD for audio and video illustrations. Review published in the International Journal of Performability Engineering, Vo. 6, No. 2, March, 2010, p. 122.